Tolerance for group trips can vary widely. Some people have an internal meltdown when a company bowling outing is so much as mentioned, while others might be the enthusiastic ringleaders of a family reunion taking place on a cruise ship. We’re skeptical of those people on the cruise ship wavelength, but we also know that doing things with other human beings in an organized manner can sometimes be a good thing. Omakase Room By Tatsu is a sushi place that’s sort of like a group trip, but without flip flops and nametags and with absolutely zero screaming. At this quiet, below-ground spot in the West Village, you and nine other people will be asked to arrive at precisely 6, 7:30, or 9pm. In the 90 minutes that follow, the 10 of you will receive, almost in unison, 18 pieces of top-quality, simply prepared sushi. You’ll order some sake or wine of your own choosing, but otherwise, this is a sushi meal that follows a close script. Fortunately, the sushi is very good, and you won’t be disappointed in the dozen and a half pieces that get placed in front of you. While the choreographed, carefully-timed production makes for a nice meal with no real flaws, the strict 90-minute time frame does add pressure, and doesn’t allow for much cushion to finish off your sake leisurely. For $145 before tax and tip, it can feel like a short evening that you’re a bit rushed out of. Especially when your coat is brought over as you’re paying the check. Of course, in most ways, Omakase Room By Tatsu is absolutely nothing like a group trip. For one, it’s extremely quiet, and there’s no music playing. That, paired with the minimalist space, makes this restaurant feel like a place you should sit up straight, pay attention, and refrain from using curse words. 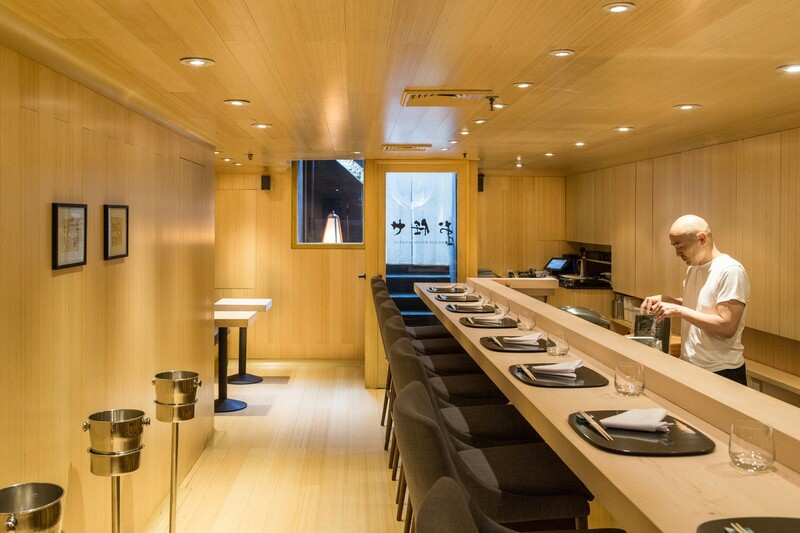 Omakase Room By Tatsu serves a traditional omakase sushi meal that sushi purists in particular will enjoy. And if someone is nice enough to invite you, you’re in for some expertly-prepared fish. But for the price, there are other places we’d be more likely to go back to for a dinner without the restrained time frame, which are a bit more suited to a celebratory occasion. The 18-piece meal here is all nigiri sushi, with minimal accoutrements. The oyster, uni, and salmon that’s smoked in a box in front of you are highlights.